Many many years ago I worked at a historical society and we were expected to site three original sources for any information we passed on. I’m a research hound. I love hunting facts. Believe me, one original source isn’t easy to come by sometimes. And sometimes finding three is next to impossible. So here in the vastness of the internet we have the ability to hone searches to get exactly what we’re looking for. Let me just say the internet too small. The thing is, much of of the truth turning up on searches originates with Ask.com or Wiki and is used over and over again. I don’t know who writes for Ask.com but Wiki is user written but not necessarily by experts in the given topic. Wiki can be useful if you know how to use it, especially if the author gave citations to the facts presented. Other times you just get a repeat of the same junk. An example is that ridiculous email of historical facts buzzing around the web for the last 15 years. You know the one I refer to– the one that explains the history of babies literally being thrown out with the dirty bath water. Anyway…the best I can determine is the concept of coal for bad kids comes from the Dutch in the 1600’s. One fact turning up online says children were happy to have coal in their stocking because it would keep their cold and starving family warm. Really? A single chunk of coal would do that? Nonsense. It’s obvious the whole coal issue is a what would you rather have scenario — toys and candy in your stocking or a lump of coal? If you’re here for the first time, we’re building a vintage holiday postcard scrapbook one card at a time. I’ve been posting one or two each day and plan to keep it up from now until January. Most assume Santa just handed out coal to naughty kids. It turns out he has other helpers. I haven’t found a Black Peter yet, but I did find a few Krampus cards! 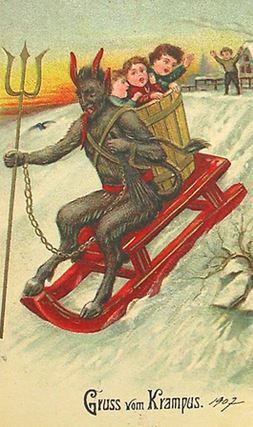 This entry was posted in Past Posts - you'll never know what you'll find and tagged Collecting postcards, Deltiology, ephemera, holiday postcards, krampus, Madeline Archer, Romance, Rose Anderson, vintage holiday postcards. Bookmark the permalink.